The College community was surprised but delighted recently to welcome a former Aquinian, John Holland. John was visiting with his wife who with other members St Vincent de Paul Society, were speaking with students about their involvement in Vinnies projects this year as part of the College’s Outreach Program. 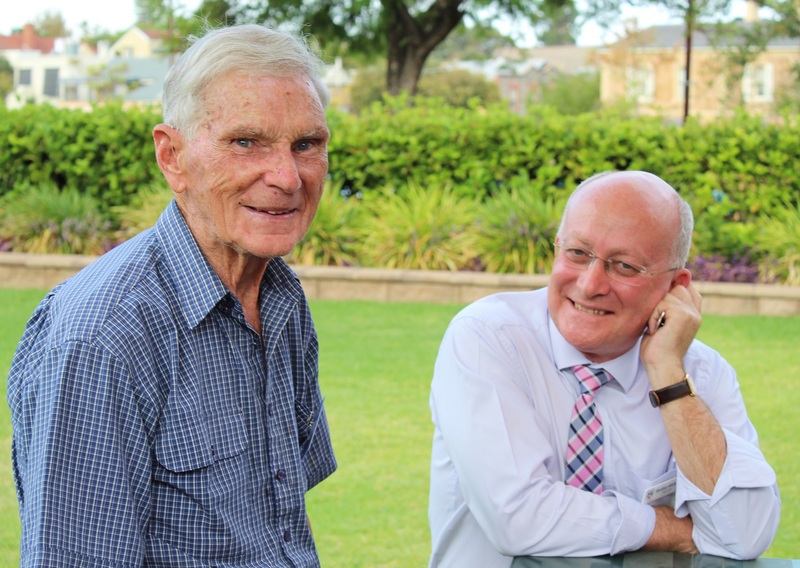 When it was discovered that John was part of the first residents of Aquinians in 1950, he became an instant hit. Students gathered about him and he was only too pleased to engage with them. They wanted to find out what the College was like almost 70 years ago, and Mr Holland was just as interested to find out about Aquinas life today. John said he had very fond memories of his time at Aquinas, as did his brother. “But we didn’t have any girls here back then,” he was quick to remark. Lenah Rasmussen, is a Pharmacy student at the University of Adelaide, as John was. John made special mention of the Jesuits who started the College, and expressed his great satisfaction to know that the Marists were here today.